The Alpha Mosasaur is one of the Alpha Predators in ARK: Survival Evolved, and one of the four Alphas living in the waters around the island. Much like its little brother, the Mosasaur, the Alpha Mosasaur roams the depths of the ocean waiting for unwary survivors to come along. 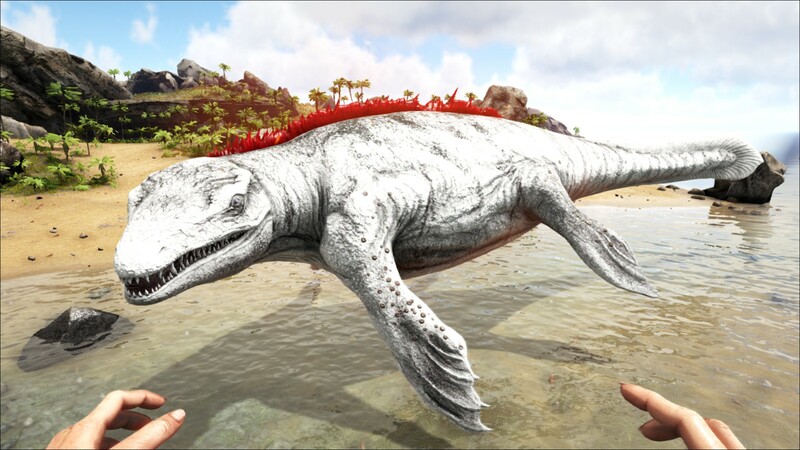 Its behavior is largely unchanged; it will swim randomly in a general area until it finds a player or tamed dinosaur in range and below a certain depth, whereupon it will pursue and attack the intruder. However, the Alpha Mosasaur is somewhat more persistent in its chase and may briefly pursue the player into much shallower waters than its smaller brother. The Alpha Mosasaur is a much larger version of the already-imposing Mosasaur. The Alpha Mosasaur is approximately 50% larger than its normal counterpart, and comes exclusively in black, white, and red. Like other Alpha Predators, it sports a distinctive fiery red fog that can be seen from some distance, even underwater and without a SCUBA mask. This section displays the Alpha Mosasaur's natural colors and regions. For demonstration, the regions below are colored red over an albino Alpha Mosasaur. The colored squares shown underneath each region's description are the colors that the Alpha Mosasaur will randomly spawn with to provide an overall range of its natural color scheme. Hover your cursor over a color to display its name and ID. For example, "cheat SetTargetDinoColor 0 6" would color the Alpha Mosasaur's "body" magenta. The Alpha Mosasaur - Caverns is a variant of the Alpha Mosasaur that can be found in the Caverns of Lost Hope and the Caverns of Lost Faith. It is identical to the Alpha Mosasaur in terms of stats, but due to being a cave creature, it spawns at higher levels than usual. 5The Alpha Mosasaur is incapable of drowning. A low-level (1-20) Alpha Mosasaur is generally no match for a powerful tamed Mosasaur with a good saddle. Barring any surprises a player with such a mount can make short work of the Alpha. If Plesiosaurs are to be used, attack with a group, keep an eye on their health and be ready to pull up to heal. A herd of sharks will also work but will probably suffer a casualty or two. A mid- to high-level Alpha (21+), on the other hand, may require considerable softening before even tamed Mosasaurs can bring it down and should not be attempted without either a very large school of high-level tames or several tribemates. As their health and damage rises quickly with levels, the highest-level Alphas will require considerable planning and coordination. Low-level Alpha Mosasaurs require little strategy if you have a sufficiently powerful sea force or one very powerful tamed Mosasaur. Beware, though- like all Mosasaurs, Alphas have a very broad bite area and will likely be doing damage to several of your tames at once if you decide on a dogpile strategy. If you do not have powerful sea mounts, it's possible to whittle one down by luring it to a sea cave and taking refuge where it can't reach you, though this is dangerous as the Alpha will have to be repeatedly lured back to the cave when it loses interest. High-level Alphas require extensive planning and preparation, with the largest ones reaching staggering amounts of HP and damage. If opting for a dinosaur-based assault, several players will be required to coordinate roles such as tanks, damage, and supplying the tanks with enough meat to heal. Well-prepared players can quickly heal their fleet and bite the task off in chunks, Alpha Mosasaur will not heal quickly enough to survive a repeated hit-and-run strategy. Be aware of your surroundings as well- nothing spells doom more quickly than being sandwiched between an Alpha and a rock face. It is not practical to take on high-level Alpha Mosasaurs with ranged weaponry due to their large health pools necessitating a massive expenditure of resources to kill them. A manta is also useful for killing an alpha mosa due to its downward attack. Just swim above it and keep attacking, while rising towards the surface. Eventually, the alpha mosa can't rise any further, and you can attack it as it tries to descend without any fear of it fighting back. Rinse and repeat. Another strategy is to use a Tusoteuthis. Swim near the alpha and turn away from it. When it chases you, swim directly up, tentacles down. When it reaches its max aggro height, start attacking it. The Tusoteuthis attacks 3 times per click, and very fast. If you attack constantly, it seems to get stuck in your squid's tentacles. Keep attacking it until it breaks free, then repeat. You will take some damage, but with at least 20k health, you should be fine. The Tusoteuthis gets a lot of health per level, so it shouldn't be too hard. With 375% melee damage, it took about 5–10 minutes to kill a lvl 44 alpha. You can use the pearls from the alpha to tame a higher level squid, allowing you to kill higher level alphas. Additionally, luring an Alpha Mosasaur into an underwater cave with auto turrets works well. Place a generator on top of the shelf inside of the cave, then lower junction boxes into the water close to the floor of the cave. This allows players to place turrets underwater that can still be powered, simply set the targeting of the turrets to high and attack to either "wild only" or "all." Be careful as turrets are regarded as wooden structures and will be broken easily if the Alpha Mosa gets too close, to fix this make sure to put the turrets as far back into the cave as possible. This strategy was tested on a level 45 Alpha Mosasaur with 6 Auto turrets, it takes about ten minutes to kill the Alpha and about 300-400 bullets. If the Alpha swims away, simply swim out of the cave below the Alpha to regain agro. Do not attack the Alpha Mosasaur with melee weaponry. It will not end well. If opting for ranged weapons, the most powerful crossbows you have will still take a long time to kill it. Dinosaurs are the only truly practical weapon against the Alpha Mosasaur. Any tames that take it on should have very high health or be expendable. One of the easiest methods, however, is to simply hover above the shallow water level and fire arrows down at it. Expect to break a few SCUBA Tanks, and bring spares. Local residents of the deep sea, such as the Plesiosaur, Mosasaur and Angler. While less common in the deep water, you can still expect to find plenty of Megalodons and brush into the occasional Manta. If using a cave for refuge, Eurypterids may sometimes spawn. Being underwater, especially in the Snow Biome, can quickly freeze the unprepared survivor. Suffocation is an ever-present danger, especially if the Alpha gets a bite in on a survivor. One bite is often enough to destroy most SCUBA gear. If you (somehow) survive the encounter, you might not for long. As the Alpha Mosasaur is an excellent source of Black Pearls, there may be competition from other tribes to harvest its bounty. The Alpha Mosasaur will (briefly) pursue its prey into much shallower waters than any other deep-water predator. Be certain to keep moving for a short while after you surface lest the Alpha take one of your tames back down with it. Like all Mosasaurs, the Alpha has a wide turning radius. However, due to their large HP and damage it is not advisable to try and exploit this to kite them as any latency at all may end in death. This is, however, useful in making an escape if you find your mount chewed out from under you. Alpha Mosasaur cannot fit in caves, making these (theoretically) safe retreats. Its large body size can also be exploited, allowing very large crowds of tamed dinosaurs to get within melee range to kill it quickly. 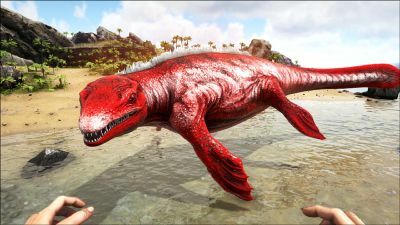 This is the first aquatic Alpha to be released in Ark. Like the other Alphas it is very fast and should generally be avoided, unless if one has enough tames and equipment to take it down. When players are underwater without a SCUBA mask being worn, the fiery red fog emitted from the Alpha Mosasaur has a green tint to it.